Whiling away his time on the Delhi Daredevils bench, Paul Collingwood, nurdler par excellence, once asked Virender Sehwag about the thought process in his mind when a bowler is running in. Did he for example, think about his feet position and hand movement and keep saying to himself, “I’ve got to get this right." The freewheeling soul replied “Watch ball, hit ball." Not for him rigorous scientific studies about areas to hit or a risk-reward analysis for shots. He often plays in the air confident of clearing the fielder. The coaching manual is thrown out of the window; nay, it perhaps never existed for him and footwork is a topic for gnarly ex-Yorkshire cricketers in the media box to grumble about. As the support staff gets packed with performance coaches, shrinks and video analysts, he disdainfully carries on as he always has. Miss a ball, play a foolish stroke, and mind you there are plenty of that, there might be a rueful smile. At most. Whereas a Dravid might berate himself and a Tendulkar stares at the pitch and away from the bowler to get back his focus, Sehwag just forgets about it and gets back to what he does best. See ball, hit ball. He might be on 150 or zero. Modern day crickets rate athleticism highly and are ever eager to talk about hitting the gym. Our hero waddles around with a pudgy figure which bespeaks a rich diet of milk, butter and paneer, which the Jat wrestlers in the Najafgarh area of Delhi where he grew up swear by. In times where cricketers are forever in the public gaze and depend upon reputation consultants and diction coaches to burnish their image, he hardly cares for political correctness. Not for him vague and inane sound bites (“we are not taking the opposition lightly; looking to bowl in the right areas and playing to our strengths") that international cricketers mouth when playing the Wollongong Club XI. Once before a test match, he described Bangladesh as an “ordinary side." He calls it as he sees it. Just like his batting. For a man who depends upon the game for a living, he doesn’t see cricket as a matter of life and death. That’s not to say he is not serious. For those inclined to such things, statistics prove his worth to the team. An average of 57 in Indian Test victories, centuries in the alien conditions of Australia, England and South Africa, a 150 plus average whenever he crosses a century in Tests, quick fire contributions in key innings such as when India chased 387 to win a test against England in Chennai three years ago, all highlight his importance. 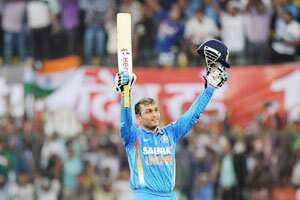 But then, just measuring him by numbers is a disservice to Sehwag. He brings to the game a certain joie de vivre, an insouciance which makes him stand apart from robotic cricketers playing assembly line cricket. He is a throwback to an age when cricket was just a game, not a money spinning machine, and cricketers played the game for the sheer love of it and were performers. As Peter Roebuck wrote after he scored 195 in Melbourne in the 2004 tour, he is indeed the last of the amateurs.